Ever wondered how much your local authority would get per year if the Get Britain Cycling report was implemented? Have you wondered how much your local authority would have to spend on cycling if the Get Britain Cycling report was implemented? Particularly the point about £10 to £20 per head of population per year. Well wonder no longer as I’ve created a spreadsheet with the population for each local authority in Britain based on the last census. You can search for your Local Authority in the Google Doc. How much infrastructure could be built in your area if this level of sustained funding was implemented? This entry was posted in Cycling on June 10, 2014 by smsm1986. One of the big problems with the funding of cycle infrastructure in Britain, is that unlike other things it is rare for there to be a dedicated revenue budget for the cycle infrastructure. The City of Edinburgh Council is one of the notable exceptions who have allocated 5% of the transport budget and are increasing it over the next few years. On the other hand in many other parts of Britain, such as Suffolk, cycle infrastructure is generally funded either through Section 106 money from new developments, or through bidding for specific projects with certain pots of money that get announced from central government from time to time. There is generally relatively little money in the main transport budget allocated to cycling beyond repairs. With the Section 106 agreements the money from a single development is often so little that it won’t give a single improvement scheme, and the money if often banked until there are several developments that provide Section 106 money before a scheme is implemented. Also recent changes mean that it’s much easier for developers to not pay up, or argue that the demands are too onerous. With the bidding process for the special pots of money that get announced from time to time, there are various problems with the system. It’s unknown when the next pot of money will be announced nor how much it will be. Often it will be short notice, so there won’t be enough time to draw up the bid in time for the bidding process or spending the money, such as when it’s got to be spent in the same financial year. I have heard of cases where the council officers ask local cycle campaigners a few days before the bid is due, which often isn’t enough time to respond. However councils and cycle campaigners can be organised and ready for this situation to occur. Matt Turner has a blog post listing all the announcements from central government highlighting investment in cycling, which he keeps up to date. However a lot of the funding is mixed with other sustainable transport funding, which means that that councils don’t have to spend the money on improving cycle infrastructure, thus it’s harder to come up with a figure of how much has been spent on cycling. It is also extremely complicated as to which pot of money can be used by each authority and for which purpose. There is a hidden cost to the bidding process as council officers have to spend time speculatively writing up potential projects which will often just be rejected due to too many bids or poor quality rushed bids. It would be much better if they were spending their time on projects which were more likely to succeed. In the past there have been network based plans of improvements, such as the LCN+ in London, however it wasn’t backed up with the regular funding needed to see through the completion of the network and often left out the hard bits, such as junctions. However if there is a single point on someone’s journey where they can’t cycle safely, the transport planners have failed them, as the bicycle user may just give up and revert back to the car as they don’t feel safe enough to ride a bike. Of course this wouldn’t be a problem if cycling would have a significant revenue budget. This means that longer term plans could be much easier planned in over the longer term, as the transport planners and cycle campaigners know that there will be money available each year for cycling related improvements. It then becomes a problem of ensuring that the improvements are of a high quality, which is a much easier problem to solve than there being not enough money on a regular basis for ambitious improvements. Of course there could still be some form of bidding process for bigger pots of money for bigger projects, however that should be an exception rather than a rule. Ideally councils would have £10 to £20 per head of population per year, to spend solely on cycle infrastructure so that Britain can catchup with The Netherlands and Denmark. These figures have been mentioned in the Get Britain Cycling report, and by a Lothians MSP. For Suffolk County Council with a population of 668553 at the last census, that would mean £6,685,530 (£6.6 million) to 13,371,060 (£13.3 million) per year available for cycling. Unfortunately Suffolk County Council don’t make it easy to find the transport budget, I can only presume that it sits in the “Economy, Skills & Environment” part, which stood at £77 million in the 2013-2014 financial year, thus hard to say how much of the transport budget it would engulf. This entry was posted in Cycling on May 5, 2014 by smsm1986. Suffolk County Council currently have a consultation running about Nacton Road and Ransomes Way corridor. It is “to meet the projected increase in traffic associated with development in this corridor”. You can find out more on the Cyclescape thread. Please find below my response to the consultation. I’m hoping that many more people respond with a similar response before the consultation ends on Wednesday 5th March 2014. Has any consideration been given as to why people are driving here even so there are cycling facilities? Could it be that the cycling facilities are of poor quality? Could close passes by motorists be putting cyclists off? Could people annoyed at being put in conflict with another vulnerable road user group? Are people driving between the shops rather than cycling and walking? Cycle Ipswich members are aware of people who have given up cycling due to unclear cycling facilities, or too many near misses or close passes. The nearby Ravenswood estate is just off the Nacton Road, it has a high level of cycle to school, yet few people will venture out of the estate on their bike to do something like shopping. Why are these people not venturing out of the estate much by bike? You need to look at these issue before implementing designs which will induce even more traffic. Throwing cyclists on to the pavement with pedestrians should be a last resort, rather than a default action that it seems to be in Ipswich. This creates conflict with pedestrians and doesn’t create a pleasant cycling experience as you have to cycle slowly if there are pedestrians about. Dedicated space for cyclist, and no I’m not talking about a white line down some legalised pavement cycling is what is needed. If shared use pavements, or legalised pavement cycling as I prefer to call them worked so well, significantly more people would be cycling in Ipswich. Light segregation which will be in the next version of London Design Standards, and has already been implemented on Royal College Street in London for example is an option to increase flexibility, and is also fairly cheap to implement. Would you be happy to have your 8 year old child using these roads on their own or would an 80 year old be happy using the roads? If not, the facilities on the roads aren’t good enough. You should take a look at the video and information at http://www.protectedintersection.com on protected intersections. There are many junctions in the proposals where cyclists and pedestrians are expected to cross two or three lanes of traffic. This is something that is really hard to do, especially if you get one stationary lane and another with faster moving traffic. You end up waiting in front of a stationary vehicle while a gap in the passing traffic opens up, and then the driver gets annoyed as they can’t continue due to the traffic causing them to be stationary having moved on. The Dutch have spent a lot of time looking into the safety issue of cyclists and pedestrians crossing multiple lanes at an uncontrolled crossing. For any uncontrolled junctions they now narrow the junction down to a single lane so that you only need to cross one lane at a time, and motor traffic is slowed so that it is safer for everyone, thus there are fewer collisions. It also makes it subjectively safer for pedestrians and cyclists thus more walk and cycle. If multiple lanes are needed, a controlled crossing is used, however the timings are very dynamic with very good detection of cyclists and pedestrians, and avoid them waiting for a long time, as currently often happens in Ipswich. There are many dog leg crossings in the proposals. As both a pedestrian and a cyclist, especially having used a trailer in this area for transporting good from the shops, I find them a total pain to use. Have any of the people proposing these taken a look at how people currently use them. They’ll find that many people just ignore the zig zag and cross straight over and walk over the kerb stones using a more direct route, often ignoring the second signal. I find it extremely unfair that motor vehicles don’t get the same treatment as pedestrians and cyclists when going through junctions, I’d really like to see a motor vehicle junction where they arrive and have to wind down the window to press a button and then get a green after a bit more waiting. The driver then has to do an awkward maneuver to get through the junction, even if they are going straight on, including pressing another button to complete the passage through the junction. The on the first page could have a more up to date map background, for example OpenStreetMap is much more up to date, with no costs or requirements other than attribution. 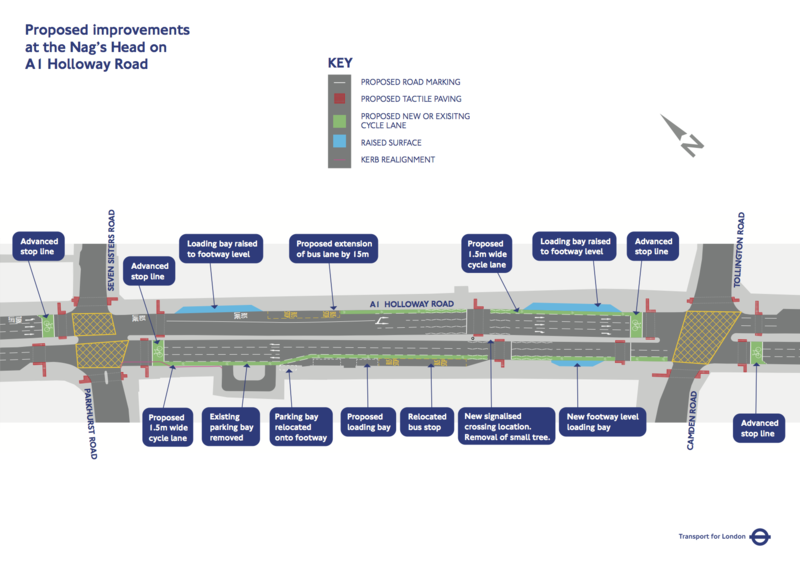 As the National Cycle Route 51 travels under the A14 and across the slip roads, consideration needs to be given here too, to make it safer for cyclists crossing the slip roads as it can currently be quite difficult. The slip roads need narrowed to slow motor vehicles and priority is given to cyclists, which is part of the Dutch strategy at encouraging cycle usage, and is perfectly possible to implement here. Will cyclists using the legalised pavement cycling have priority over turning vehicles at the junction into Orwell Country Park? The is the only section where I will accept a shared pavement as a solution for space for cyclists due to it being almost wide enough the whole way, and there are very low expected demand from pedestrians. The dog leg crossing needs removed, see explanation above. Where there’s an uncontrolled crossing there ideally needs to be only one lane of traffic for cyclists and pedestrians to cross, or an absolute maximum of 2 lanes, whereas in places there are 3 lanes. The lanes also need to be kept as narrow as possible to slow motor vehicles to increase safety for cyclists and pedestrians. Minimisation of lane switching is also needed. The wide corners that can be taken at speed, which makes it even more difficult to cross the road, especially when combined with the number of lanes that need to be crossed. There needs to be clear space for cyclists, without mixing them with pedestrians or motor vehicles. Motor vehicles need to be slowed to prevent collisions. Tighter corners are needed to slow down vehicles and improve sight lines so that drivers can see cyclists and pedestrians and reduce the risk of them being in the driver’s blind spot. Where is the space for cycling along this road? Has anyone questioned why there are so few people walking and cycling along here to access the shops? Will the speed limit be reduced to 30 mph from the current 40mph? The current legalised pavement cycling is horrible for both cyclists and pedestrians. The Cranes to Felixstowe Road section is particularly bad due to the narrowness particularly on the west side of the road as it gets close to the railway bridge. I’ve cycled along there with a bike trailer on a Brompton and had to wait at a wider section for pedestrians to pass. This places cycling as a second rate mode of transport. Instead of 3 lanes of motor vehicles, there should be some light segregation used to create a safe cycle lane. The light segregation is relatively cheap to install, and will be in the upcoming London Cycle Design Standards. This will do far more to promote cycle use than the current shared footways which discourage many people from cycling as they are so inconvenient. Why can’t pedestrians and cyclists get from John Lewis on to Ransomes Way using a more direct route that means that they don’t have to go the full length of the car park first? The dog leg crossing over James Bennett Avenue need to be changed to straight over crossing, ideally without having to stop in the middle and press the button again, otherwise you are designing the road environment to promote motor vehicle use instead of sustainable modes of transport. Similarly the crossing over Ransomes Way needs to be timed that you can cross straight over without stopping. By reducing the length of the middle roundabout, that will help shorten the distance that cyclists have to cross, thus reduce the time for them and the waiting time for motor vehicles. This is a horrible set of changes for cyclists. As someone who has recently cycled up the west side of Ransomes Way to cross over Felixstowe Road to get to Sainsburys and Homebase with a trailer on the bike, it was a horrible experience. I got stuck in the middle of the road fearing my trailer would get damaged by vehicles passing behind me. The new plans make it even more difficult for cyclists as there will be no crossing on 2 sides of the roundabout. This means that if a cyclist happens to go along the wrong side of Ransomes Way they either have to take a long detour up Felixstowe Road to cross, or dart across the fast traffic, or go back they way that they came. Crossing the two lanes entrance and exit to the Sainsburys car park is also horrible currently as the cars go so fast, this needs improved for cyclists trying to access the cycle parking for Homebase. There should be a maximum of 1 lane in and 1 lane out of the car park for the best possible safety. I would recommend changing Murrills Road to be a bus gate near the Homebase, thus reducing traffic at this junction. It also encourages more people who live in the local area to walk and cycle to these shops, as the bicycle or walking is journey is shorter and more pleasant. I don’t see why there needs to be a through road here private motor transport. This is standard practice in The Netherlands. None of the changes at this junction will encourage more people to get on a bike to get to the shops here, rather it will put them off, and induce even more motor traffic. The position of the pedestrian crossing is significantly off the desire line, thus I expect some pedestrians to be crossing closer to the roundabout. I’m concerned about the width of the cycle lane here. Will it be 2 metres wide, thus giving enough space for cycling? Far too many cycle lanes in Ipswich are so narrow you can’t even fit the bike in them while cycling, never mind the passing space so that cyclists feel comfortable with vehicles passing. I’m concerned that there will be pinch points created and many vehicles will pass cyclists too close, thus discouraging people from cycling along this section of road. This road has plenty of space to put in real dedicated space for cycling, whether it be a separate track (not the pavement, which is for pedestrians), or light segregation. Is the island in the middle of the crossing really needed? Surely giving more time for pedestrians to cross in one go will encourage more people to walk, than if they may need to stop half way on the refuge. As there will be an increase of traffic on Landseer Road the whole of Landseer Road will need to be looked at too. There currently is issues with the cycle lane being too narrow, and in places gets a build up of leaves in the autumn, particularly where it goes past the park. Floating bus stops, where the cycle track goes behind the bus stops are also an option along these roads. The dog leg crossing needs to be a direct straight across type instead. Will cyclists turning left be protected from vehicles cutting the corner when turning left? I would much prefer the space used for the right turn to continue on the Nacton Road towards the town centre to be used to protect cyclists going round the corner, however it also needs to be designed to allow them to safely get across and continue on the Nacton Road if they wish to do so. 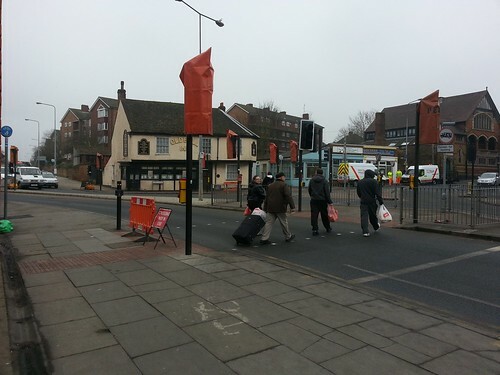 This entry was posted in Cycling, Ipswich and tagged consultation, cycling, space4cycling on March 3, 2014 by smsm1986. This evening I happened to catch the short BBC Local News at 20:00 on BBC 1 Scotland between programmes this evening. One of the items featured was the ASA adjudication regarding the Cycling Scotland advert to improve cycling safety. I then later recorded and watched the late evening news, which covered it in more depth (video below). It’s great that Reporting Scotland has picked up on the story, however it would have been better had they covered the “cycling in the middle of the road” issue much more than the passing remark. As someone who has had many close passes, including being knocked off my bike due to close passes, I have a significantly increased fear of being knocked off my bike by an overtaking vehicle. I am annoyed that the BBC didn’t pick up on the road positioning point more. This is rules 212 and 213 of the Highway Code, and is something that needs to be emphasised more, as often cyclists have to ride further out to avoid pot holes or to prevent a motor vehicle for passing so close that they knock the cyclist off their bike. Namely so that they aren’t riding on the pavement nor in the gutter and are avoiding the potholes as per the highway code, whilst not riding on the pavement, which I’m sure someone else would complain about. Just to be clear, @ASA_UK looked at an advert about space for cycling and decided to ban it because it promoted giving space to cyclists. @SRDorman @ASA_UK @beztweets astounding isn't it? We're even rushing to the defence of the Nice Way Code. Bez has made a great post on the problems with the ASA ruling, including links to the original background, thus I don’t need to repeat them all here. This entry was posted in Cycling, Scotland on January 30, 2014 by smsm1986. The BBC London news this evening (27 January 2014), had a segment on the new eye level cycle lights being introduced at Bow Roundabout today. I think it’s great that they are starting to be used, however the design of the traffic lights at the junction needs an overhaul as it’s extremely dangerous. The first part of the correspondent Tom Edwards talking about it, highlights the confusing nature of the lights, whereby an average person sees a green cycle light and believes that they can proceed through the junction, as is the case with most junctions in the UK, and doesn’t realise that they have to stop at the second traffic light a few metres later. This is a horrible design and needs to be changed urgently so that it is not confusing to the average user, before someone else is killed at this junction. If the design is not changed I fear there will be another death here as it’s too confusing for the average person. A random person should be able to easily understand the design of the junction and be able to safely navigate it, otherwise the designers have failed. The current 4 second head start is split into two parts. It’s based on 2 seconds to let the cyclists set off and another 2 seconds between the motorists setting off and getting to the traffic line. If there is a lot of cyclists, there is still potential for a motorist to crush a cyclists if they are turning left. Ideally a new design for the traffic lights is used, which makes it safe for cyclists and pedestrians. By holding motor vehicles while cyclists get a turn, and vice versa means that pedestrians will also get a chance to cross. It will add a very small delay to motor vehicles, however if the subjective safety of the junction is improved enough then the number of motor vehicles will reduce. The separator between cyclists and motor vehicles needs to be extended to the final stop line before the roundabout thus increasing the safety for cyclists. Also the traffic lights should be able to be phased dynamically based on the traffic levels. For example if there are suddenly a lot of cyclists and not many cars, give the cyclists more time. If there happens to only be 1 cyclist, then it’s best to change for them with minimal waiting time, but you only need to stay green for a very short time so that they can clear the junction. It will require reliable detection of bicycles, which isn’t the norm in this country at the moment, however will make a huge difference. Finally when there is heavy rain, giving cyclists and pedestrians more time is a great idea, as it means that they’ll get less wet, and be happier cycling. The people in motor vehicles will stay dry, thus can wait a little longer with no detriment. This entry was posted in Cycle Superhighways, Cycling, London on January 28, 2014 by smsm1986. This is my response to TfL’s public consultation at Nag’s Head on A1 Holloway Road. For when the consultation disappears on the TfL site, I have uploaded it to my blog Nags Head Junction Map and also to a Cyclescape thread. As someone who has been involved with the London Cycling Campaign‘s Junction Review Group (now Infrastructure Review Group) from it’s inception, I’m appalled TfL are still coming up with dangerous designs such as this. There are so many issues with these proposals I’m not sure where to start. Advanced stop lanes are extremely dangerous and should not be introduced into any more junctions. They are the area of the blind spot of truck. Also many people riding bicycles find it scary to cross two never mind 3 lanes of traffic. Instead a protected cycle track of 2m width minimum plus separate timings to prevent left hooks. It is essential that left turning motor vehicles are not allowed to go at the same time as straight on cyclists otherwise there will be more deaths similar to the ones at Bow through left hooks. You also need to aid cyclists that are turning right in a protected Dutch style two stage turn. Traffic lights need to be demand responsive. As cyclists are in their own track, this helps to tell when there are cyclists there rather than other modes of transport, and you can automatically adjust the timings for the demand of all traffic. This ties in with the previous point re separating left turning vehicles from straight on and right turning cyclists. This is standard practice in The Netherlands where signals will even turn red and straight back to green if there is still more cyclists there to promote cycling and reduce the probability of cyclists jumping the red light. Why are TfL still introducing dog leg crossings? (Dog leg crossings are where you cross half way, walk sideways for a bit, and then cross the rest of the way). Have any of the designers or traffic engineers taken a look at how the current dog leg crossings are being used in London? Spending just a few minutes will show that they are not being used as designed. People don’t do the sideways walk as designed and just continue walking straight on as that is the fastest route to their destination. Adding railing back in is not a solution as pedestrians just walk around then, and also there is potential for pedestrians and cyclists to be crushed against them by motor vehicles. By building the crossings the way that users actually use them, will mean that the central reservation can be removed thus making room for a safe cycle track to be put in instead, and also make it safer for pedestrians. I don’t see motor vehicles having to do a sideways jump so why should pedestrians? Why is the central reservation needed? Is it still there to make it feel safe for drivers to go fast along the road knowing that there won’t be a car coming the other direction on their side of the road? Heading south east why does 2 lanes turn into a bus lane plus a very wide lane that may be wide enough for 2 small vehicles, which later turns into a cycle lane plus 3 lanes of traffic? The merging and splitting of traffic lanes causes traffic tailbacks and more collisions. Thus minimising the potential for lane changes would help to make the roads safer. Mixing cyclists in a bus lane is not going to encourage an inexperienced cyclist, or even an experienced cyclist who is scared of being run over after too many near misses in the past, to cycling in this location. This is why a protected cycle track is needed. Why are the cycle lanes to the right of the bus stops and the loading bays? This creates a significant dooring and collision risk and will result in injuries or death of cyclists. Best practice in other countries such as The Netherlands shows that the cyclists should be between the pavement and the motor vehicles, including parking and loading motor vehicles, as this is the safest location. Why is a 1.5m cycle lane seen as sufficient width? This does not allow for space for cyclists to be able to overtake safely in the lane, especially if one of them has a cargo bike or trailer. 1.5m may be the minimum, as specified by the London Design Standards section 4.2.7, however it does also stipulate 2m or more where space permits in several places in the document. In this instance there is enough space here to allow the 2 or more metres width. Would you allow your 8 year old child to cycle on this road, or be happy for your 80 year old mother to cycle here after the proposals have been implemented. Would that be happy walking here? If not, the design isn’t good enough and you need to go back to the drawing board. Please stop this consultation and go back to the drawing board before wasting more time and money on dangerous designs. This entry was posted in Cyclescape, Cycling, London, TfL on December 15, 2013 by smsm1986. Back on Sunday 16th June 2013 I was on my return cycle from the Bromley Cyclists camping weekend in Essex I was cycling along and getting ready to turn right at Langford to head north. After signalling to turn right and having 3 cars pass completely ignoring 2 cyclists with their arms stretched out to indicate that they wish to turn right, I gave out a scream to draw attention to the situation as the fourth driver was already starting to overtake, and I feared I was going to be frozen out and unable to turn, thus being stuck by the side of the road. The male driver wound down the window and claimed that I was frightening his child in the back, whom I couldn’t see due to the blacked out windows. He then got of the car and came round to my side and claimed that the road was to share, of which he didn’t seem to get, as if he did, he would have waited patiently behind us. He also said that you don’t scream to turn, though he obviously was blind to the fact I had my hand out as he suggested I should be doing. I then reported it to the police, it was slightly complicated due to me living in Suffolk police’s area, and the incident occurring in the Essex police area, thus I had to give an initial report over the phone to Essex police, who then got Suffolk police to come and take a statement and a copy of the video above. The police then had problems tracking the driver down as the vehicle was hired under the name of someone else and when they went to the address given to the hire company they found that the people who were there moved 3 months before and hadn’t left a forwarding address. The police had asked me if I just wanted them to talk to the driver for some driver improvement, or to take it to court, with them pushing the former. I foolishly accepted that, which meant that they didn’t pursue the case much further whereas had I said early that I wanted to go to court they said they may have pursued it further, but there wasn’t any point. However as far I was concerned they were failing to talk to the driver at all, which isn’t what I wanted. Ah well lesson for the future. This entry was posted in Cycling on October 29, 2013 by smsm1986. At the end of April I was in Birmingham for the Cycle City Expo conference. As part of one of the optional site visits and workshops on the first day I snapped the following G4S van to be blocking a cycle track on National Cycle Route 5 at a set of traffic lights on the return journey. This was quite apt for the discussion about issues on the route. 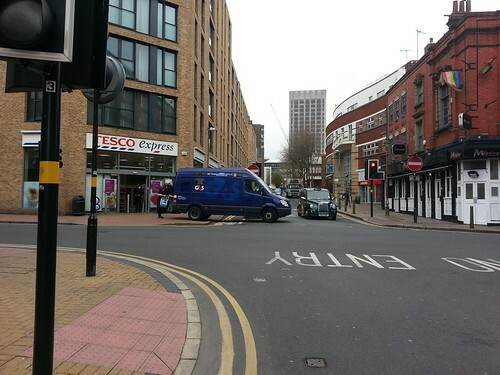 I decided to quickly take the photo and to then send it to G4S to see what they would say. Seeing that their website had a section on social responsibility made me more interested in seeing what their response would be. A day or so later I had short email to say that it had been forwarded to the branch manager. Then within a hour I had a call from the branch manager to confirm that it was definitely their van in the picture, and wanted to verify the date and time that the photo was taken so that they could find the particular crew involved. I also let them print the photo so that they could put it up in the depot as an example of how not to stop in front of a store. I have identified the crew of the vehicle and have interviewed the driver. We have agreed the position of the vehicle is unacceptable and we both offer our apologies. I’ve also spoken to other crews who service this particular customer as to where we should and should not park. Whilst everyone here agrees this is a very poor place to leave a vehicle the reason for the driver parking in such a poor position was the drivers attempt at reducing his and the publics risk of an attack. G4S Birmingham unfortunately has quite a high attack rate. Last year it was approximately one attack per week and at peak times up to three attacks per week. As well as our crews being injured in the past there have been bystanders injured also and one incident where a member of public was killed. Crews have to decide on a site by site basis where the best and safest position to park the vehicle is and in this particular case we got it very wrong. The driver had forgotten the risks and danger he was causing to traffic and he will be more considerate in the future. Thank you for bringing this to our attention as it helps us all at G4S improve and maintain standards of driving and parking. Also thank you for permission to use the photo for training purposes it will be on our notice board with an explanation of it. If you have any further questions please reply or feel free to call either number below and I’ll be pleased to answer them. So it’s an extremely difficult balance to strike between parking in safe location and also parking in a location that minimises the risk of the crew dealing with the delivery or collection. With a decrease in parking and loading space, with the space in cities often being either pedestrianised or being reallocated for cycling does make it harder for these risky deliveries. It shows how hard it is create streets that cater for everyone. This entry was posted in Cycling on May 26, 2013 by smsm1986. Does cheaper car parking really improve Ipswich town centre? 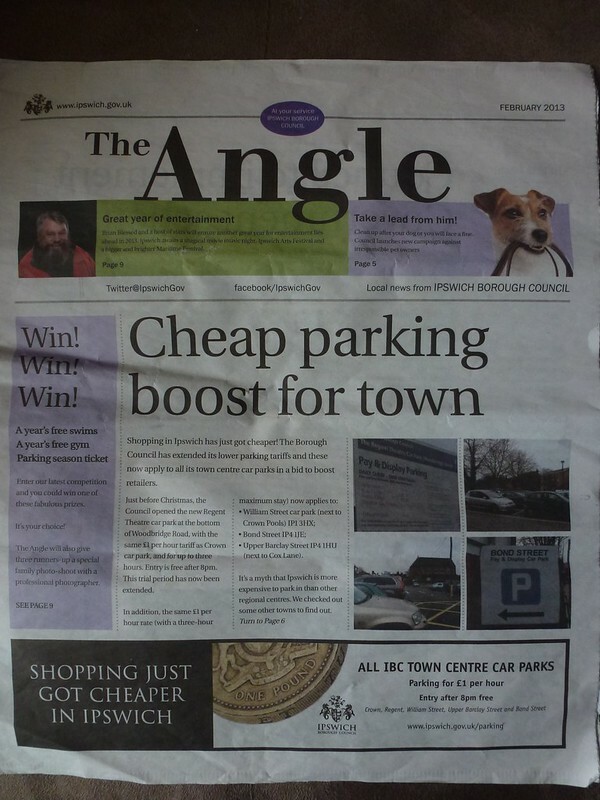 In the February 2013 issue of the Ipswich council newspaper, The Angle, which is delivered to local residents in Ipswich, they were proudly saying how the council was helping businesses by reducing car parking charges within the town. Ipswich Borough Council have reduced the parking tariffs in all of its town centre car parks “in a bid to boost retailers”. 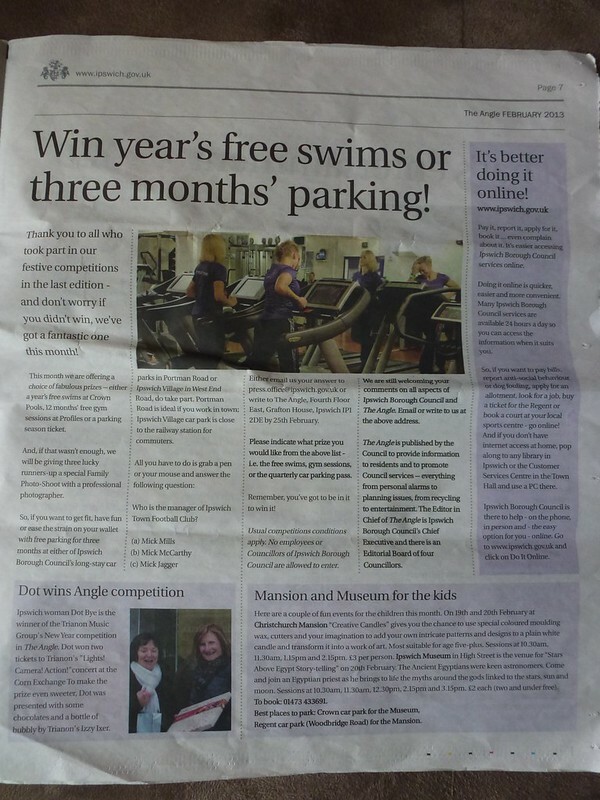 Also in the same issue they were running a competition to win 12 months free swimming or a car parking season ticket for 3 months. The council also has a project called Travel Ipswich which is all about improving traffic management and promoting smarter and sustainable transport. I find it rather strange that one part of the council is trying to promote sustainable travel, yet another is doing the opposite of promoting more cars into the town centre. I’d be much happier to see one of the prizes to be a free bus pass for a family for 3 months. This is especially true if it went to a family who currently primarily uses a car, but could use public transport instead to try an encourage them to travel more sustainability. I’m sure there are other ways that the council could help the local businesses such as with the business rates or other improvements to make it much nicer to cycle from the suburbs and out lying villages to the town centre. In some of the newer suburbs of Ipswich there is fairly high levels of cycling to school due to the road layout, with many cycle paths alongside the roads including past schools. We’ve recently seen your latest blog post on cheaper parking and just wanted to clarify a few things you had mentioned. The Travel Ipswich project that you refer to is led by Suffolk County Council, not IBC, and more information can be found here:http://www.travelipswich.co.uk/. One of the aims of the project is to improve traffic management, as well as improving pedestrian and cycle routes across the town. 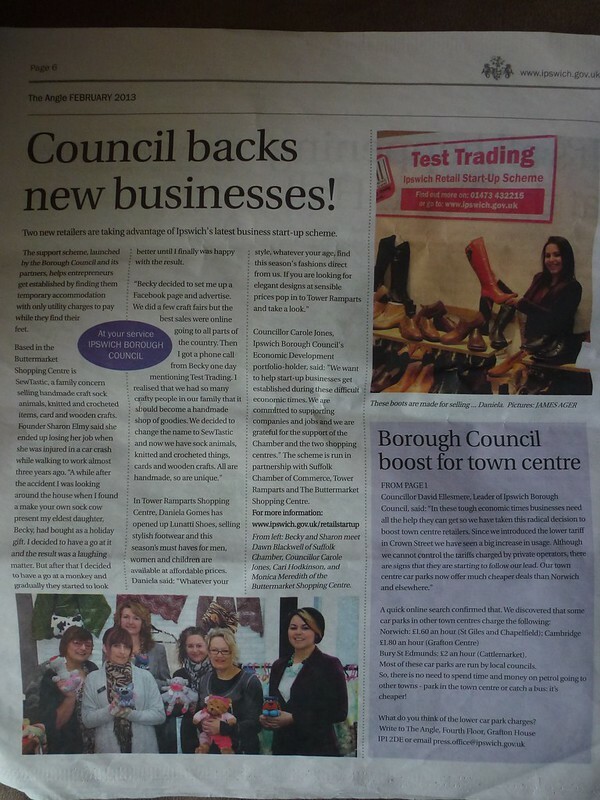 Also, Ipswich Borough Council collects business rates but it does not set business rates in the town. The level of business rates is decided by the Government’s Valuation Office Agency, over which the Council has no control. If you have any questions or want to check anything in future, please don’t hesitate to contact us. This entry was posted in Cycling, Ipswich on March 21, 2013 by smsm1986. Recently the junction nearest to where I live had some temporary traffic lights again for some roadworks. Unfortunately the toucan crossings on the junction had a sign added that states “Crossing not in use”. However the next nearest option for crossing requires going back on yourself and walking an extra 5 minutes. People who do come across the sign just ignore it as they aren’t going to do a big diversion as shown in the photo. In this case there didn’t appear to be anything elsewhere on the crossing that would cause an issue and it’s not a constant flow of pedestrians. Surely it would be much better to use signage which turns the crossing into more of temporary zebra crossing where motor vehicles have to give way or at least slow down in case there is someone on the crossing? This would make the road safer than the motor vehicle drivers driving fast through the crossing as they assume that the crossing is clear thus making it more dangerous for pedestrians and cyclists. It would also reduce the annoyance of pedestrians and cyclists tripping over the sign and being rated as second class citizens. This entry was posted in Cycling, Ipswich on March 3, 2013 by smsm1986.